There’s nothing wrong with having a ballcap as part of your style. The only thing to take into account is that you should be washing it every now and again, as some people wear the same hat every day for years without tending to the bacteria farm it’s growing. You don’t want to toss your hat in the wash, as the spin cycle might bend it out of shape forever, but you need to wash it somehow. Since you value your hat and want to keep it for as long as possible, getting this Ballcap Buddy would be a great way to maintain its integrity. 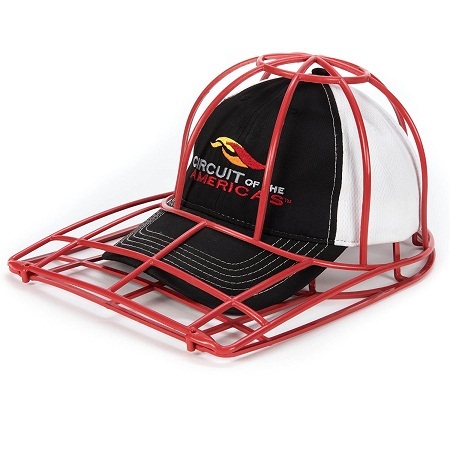 This is a plastic frame cage that will breathe new life into your grungy headgear without having to compromise its shape. These sort of things exist for bras as well, but a brassiere is going to hold up on its own in the wash a bit better than a hat. While this would work in the washer and dryer, all that tossing and tumbling might knock the cage open. That being said, sticking this in the dishwasher would be just as valid of an option for taking it from dingy to sparkling clean. It’s only going to cost you $7.95, and comes in red, black, green, and white for those that like everything in their home to match. It’s a cheap buy, but it will help you to keep your hats in good shape so you don’t have to deal with buying new ones every time an old one gets dirty.